Description: A sophisticated architecturally styled fixture is designed with a classic structural design. 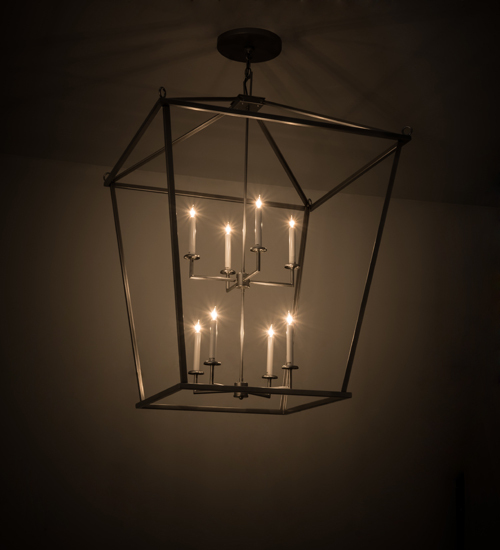 Give your decor an extra edge with this breathtaking fixture, which is highlighted with a solid steel structure that surrounds eight faux candlelights perched on bobeches. The hardware and frame are featured in a Nickel finish. Handmade in our 180,000 square foot manufacturing facility in Yorkville, New York. Available in custom sizes, styles and finishes, as well as dimmable energy efficient lamping options. UL and CUL listed for damp and dry locations.